Accurate quantification of gene therapy vectors and nanomedicines is critical at all stages of research and product development, whether for characterizing a production step or obtaining an accurate titer before assessing bioactivity. Spectradyne's nCS1TM quantifies all types of nanoparticle-based therapeutics quickly and accurately, and requires only 3 microliters of the sample per measurement. 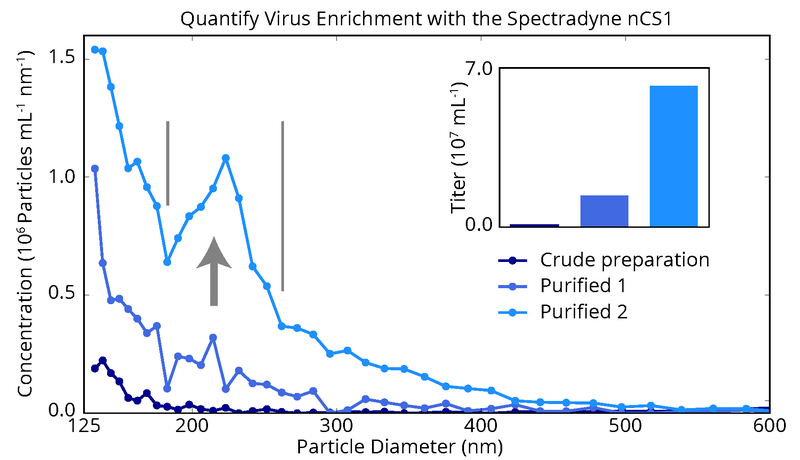 The figure below shows nCS1TM measurements of a proprietary virus-based drug product as it progresses through three stages of purification. While each stage of purification increases the concentration of particles over a broad size range, a clear enrichment of virus product is obtained with the second stage. These measurements provided the manufacturer of this product with a highly detailed picture of the purification process, and insights for optimization that could not have been obtained with any other method. The nCS1TM provides powerful insights to these researchers that cannot be obtained by any other method. Contact us today to learn how Spectradyne's nCS1 can help advance your gene therapy or nanomedicine science. A virus-based drug product measured by the nCS1 after various stages of purification. Enrichment of the virus is clearly observed after the second purification step, and could not be measured so directly and practically using any other technology. Such high-resolution and quantitative measurements as these cannot be obtained with other technology, and enable more effective analysis of process parameters at all stages of the drug development process. For more information, see our application note, or send an email to info@spectradynellc.com. We're here to help you with your nanoparticle characterization challenges.